David Adkins, Ross Bickell, and Felicity LaFortune in Merrimack Repertory Theatre‘s “The Outgoing Tide.” Photo by Meghan Moore. LOWELL –– Sometimes a production is a perfect combination of writing, directing and acting and when it happens, it’s a beautiful thing. 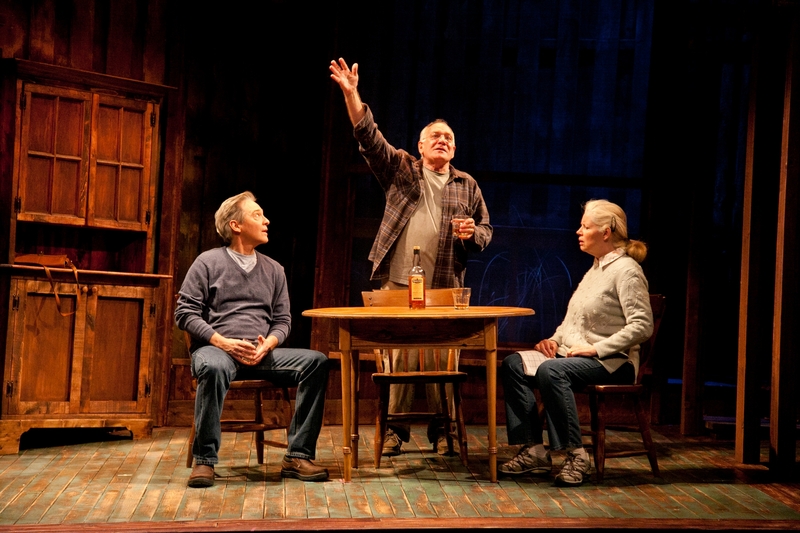 The Merrimack Repertory Theatre production of Bruce Graham’s “The Outgoing Tide” is MRT Artistic Director Charles Towers’ final production for the theater after 14 seasons. It is the type of show that has been right in the wheelhouse of Towers: an intimate piece by a playwright he’s worked with in the past, and a cast of three excellent actors — Ross Bickell, Felicity LaFortune and David Adkins. Towers’ direction and the performances are both pitch-perfect and it all makes “The Outgoing Tide” one of the very best productions of the 2014-15 theatrical season. What was once a summer home on the Chesapeake Bay is now the year-round retirement home for long-married, now retired couple Gunner and Peg. Ross Bickell is Gunner Concannon, whose mental functions have started to decline precipitously, to the point where son Jack (David Adkins) has been summoned to the home to talk to his father and mother Peg (Felicity LaFortune) about what comes next. There’s a startling opening scene when we see Gunner doing some late-season fishing, talking to someone he seems to have just met, until ultimately we realize that he doesn’t even recognize his own son. Playwright Graham has equipped the aptly-named Gunner with an array of dark one-liners as a defense mechanism in his declining state– the blackest of black humor — and Bickell delivers them in rat-a-tat-tat fashion, in machine-gun bursts. He is raging against the dying of the light. There’s even an array of Italian jokes for Gunner to deliver when he visits his dying friend Salvi. Gunner, a high-school dropout who started his own successful trucking business, has an opinion about everyone and everything and isn’t afraid to express it. But he also at a state in his life where he can’t remember simple everyday words. Gunner and Peg have visited an assisted living complex with an adjoining “A Wing” for those no longer able to live without 24-hour care. Peg isn’t about to abandon ship, and Graham takes the time to look back at the beginnings of their 51-year marriage, the circumstances around it and the trials and tribulations that the relationship has survived, providing context for their decisions. There’s a very funny and touching moment when Graham puts the couple side by side to opine about an important topic. “Family is most important,” says Peg. “Family is to be avoided at all costs,” says Gunner. Jack has two children who have done well but a third is putting him and his soon-to-be ex-wife through the wringer. There is a Catholic discussion about divorce. “You took a vow before Father Edward,” Jack is reminded. “Is he out of jail yet?” asks Jack. life insurance policy with a double indemnity clause that would pay double if he died in an accident, and would set both Jack and Peg up for life. His decision to take advantage of the clause is at the crux of the play, along with a promise made to Peg some time back. The design elements are in quickstep with both the acting and directing, with James J. Fenton’s well-appointed, comfortable waterside home that allows the action to move easily between the inside and the outside, including a dock, and works well in conjunction with lighting designer Dan Kotlowitz and award-winning sound designer Benjamin Emerson. I don’t know if “The Outgoing Tide” speaks even more strongly to those of us who have lost loved ones to Alzheimer’s. Perhaps it does. But you don’t have to have to be personally affected by Alzheimer’s or dementia to appreciate great acting and directing. Take heart if you think you’ll be depressed by the situation. There will be laughter, and tears through the laughter. How it all turns out in the end, well, that’s why you’ll want to go and see it for yourself. It’s a most fitting coda to Charles Towers’ tenure at MRT. 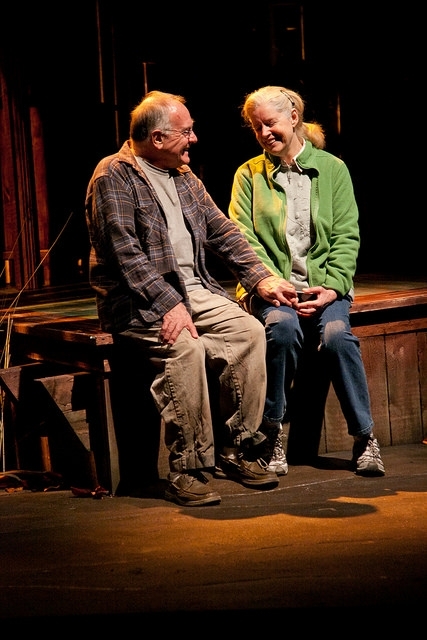 The Merrimack Repertory Theatre production of Bruce Graham’s “The Outgoing Tide.” Directed by Charles Towers. Set design by James J. Fenton. Costume design by Deborah Newhall. Lighting design by Daniel Kotlowitz. Sound design by Benjamin Emerson. At the Nancy L. Donahue Theatre though May 17. http://www.mrt.org.